The program for the funeral service for Antwon Rose. A woman holds up her fist out of the window of a car in the procession from the funeral of Antwon Rose, a black teenager who was fatally shot last week. 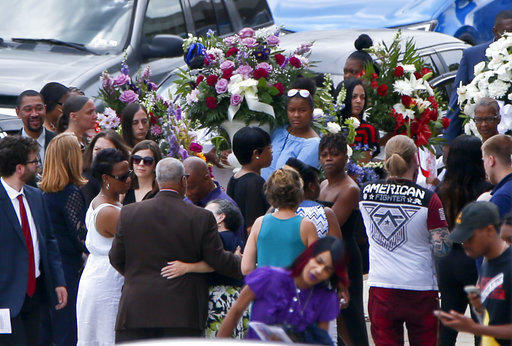 Hundreds gathered for the funeral for 17-year-old Antwon Rose at Woodland Hills Intermediate School Monday. Rose was fatally shot by an East Pittsburgh police officer last Tuesday after running away from a car that had been stopped by police. Yellow school buses shuttled in groups of people to attend the ceremony, while the procession of friends and family drove by in cars, some featuring the message "Justice for Antwon." A car with yellow window paint reads "Justice 4 Antwon / Justice 4 Antwon" as it pulls into the Woodland Hills Intermediate School parking lot for the funeral of Antwon Rose on Monday, June 25, 2018. According to the service program, Rose excelled academically and loved playing basketball, skating, and surfing. On the back of the program, a poem Rose wrote two years ago called "I am not what you think" was printed in purple italics. In the poem, Rose writes about not wanting to be "a statistic." Jeffrey Walker, who said he was Rose's cousin, called the teen a "respectful kid." "That's all I know him to be--all his life, that's all I knew," Walker said. Another cousin, Missy Carter, said the service was a "celebration." Ayodeji Young, of Homewood, talked about how Rose's death has brought attention to social injustices in the Pittsburgh area. He said the funeral reflected Rose's life. Homewood resident Ayodeji Young told reporters after Rose's funeral that protesters would continue to encourage Allegheny County District Attorney Stephen Zappala to press charges against the East Pittsburgh police officer. "Us in the community are going to keep applying pressure, keep going day after day," he says. "It was one of the best, heartfelt, most heart-warming ceremonies," Young said. Monday marked the second day without a protest since Rose's death. Community members said they would hold off on protesting the day of the funeral out of respect for the family. The Pittsburgh Department of Public Safety today said in a statement that only one person--a "motorist who incited the crowd"--had been arrested during protests Friday night. The demonstration took place near the baseball stadium on the North Shore. Officials said, to maintain safety during future protests, officers will be working 12-hour shifts beginning Tuesday morning. "The City of Pittsburgh will continue to protect protesters' First Amendment rights while assuring that all people--from protesters to city residents and motorists who may be affected by road closures--remain safe," the statement said. Rose was a passenger in a car pulled over by East Pittsburgh Officer Michael Rosfeld. During the traffic stop, Rose and a second passenger fled. A video taken from a nearby house shows them running from the car. Zappala will ultimately decide whether to press charges against the officer, but protesters have said the D.A. needs to go regardless. “He has always stood with brutalizing police officers and he’s never stood with the oppressed black and brown people of Allegheny County," said Jasiri X, an activist and musician, at a rally last week. Lawyers for Rose's family have said no evidence has been produced to show Rose posed a threat to police. The Associated Press contributed to this report. This story was updated at 3:57 p.m. June 25, 2018 to bring in additional voices of attendees. 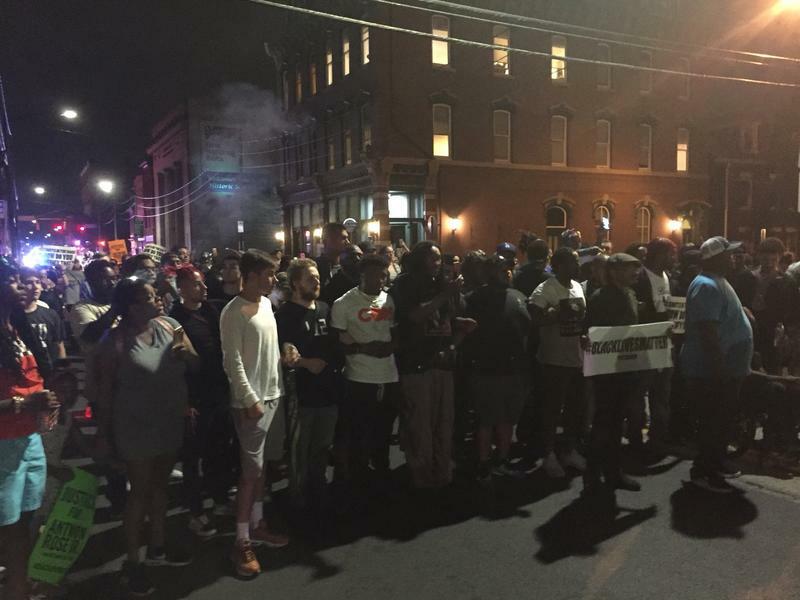 In the aftermath of Antwon Rose's death, 90.5 WESA reporters followed the protests on the streets of Pittsburgh. Listen to what those protests sounded like here. 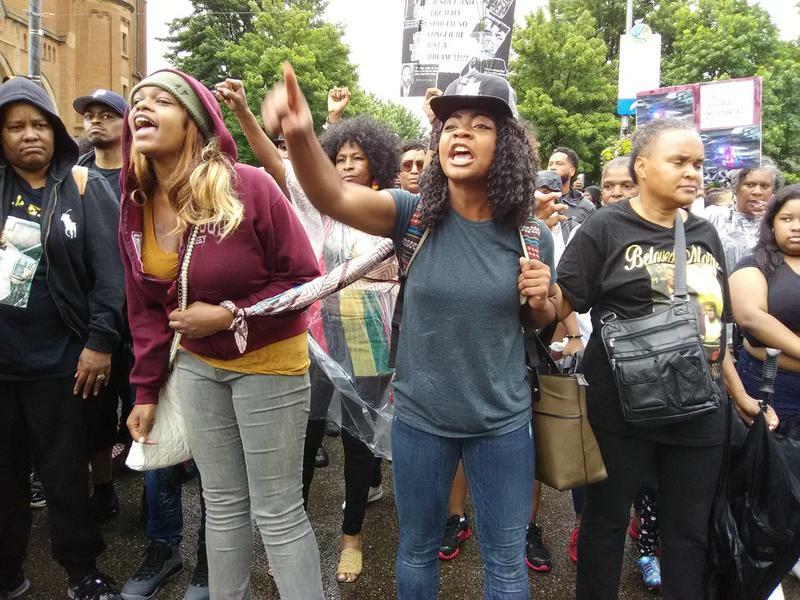 More than 200 demonstrators marched through the South Side on Saturday, marking the fourth consecutive night of protests following the death of 17-year-old Antwon Rose Jr. at the hands of suburban police. Saturday marked the fourth day of demonstrations in Pittsburgh to protest the killing of an unarmed, black 17-year-old. 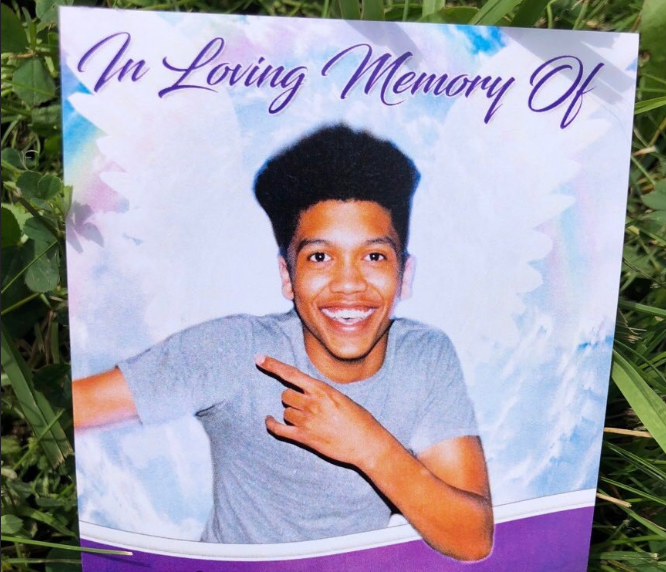 Antwon Rose Jr. was fatally shot by East Pittsburgh police officer Michael Rosfeld on Tuesday night while fleeing a traffic stop. Many are calling for criminal charges to be brought against Rosfeld -- sentiments that were on display during Saturday's Juneteenth parade to celebrate the end of slavery.